The loss of our “best and brightest” is an abiding shame, but it pales in significance with what we have wrought “over there.” I truly hope that most of our centurions are altruistic and selfless, but I have a deep suspicion, borne of years of seeing a mean streak of publically acceptable anti-Arab, anti-Muslim bigotry in this nation, that too many of them are cruel and intolerant towards the people they have conquered. What really rankles is this administration’s (and others before it) deliberate blindness towards the root of the problem throughout the Middle East, especially in the face of overt American favoritism towards colonial Jews from Europe and privileged despots in the region who conveniently produce most of the world’s oil. More than sixty years of unabated Palestinian injustice is the untreated infection that festers throughout the Arab “street” because it mirrors their daily grind of poverty and lack of opportunity and denied dignity. The war in Iraq is a manifestation of our failure to address root causes. It will not be the last if we continue to slap band-aids on every petroleum-producing pimple while we pretend that there isn’t a much greater problem lurking below the surface. Nothing feels worse than being played for a fool. It strikes at the soul like little else; this thing of trusting someone at their word and then finding out you were deceived. I guess that’s why, on this Memorial Day, so many Americans feel such bitterness and resentment toward the Bush/Cheney Whitehouse. Thinking back to those oh-so-assured words of the imminent threat of Saddam Hussein, and his role in the September 11th attacks, now fills the heart with disgust. We were sold a sparkling Buick that turned out to have a bad engine and sawdust filled transmission. The intelligence that contradicted or questioned the dire projections were never heard, and the warnings of the consequence of an Iraq invasion by the experts were conveniently omitted from the discussion. 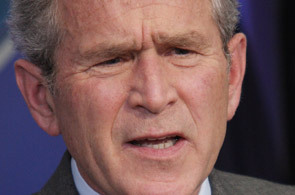 In his obsession to make war on Saddam Hussein, Mr. Bush played us for fools, went in half-cocked and disregarded the multiple warnings of prudent counselors. The worst of it is the loss of our best and brightest. These valiant and idealistic young men and women, represent the best of us. Their altruism and selflessness are the stuff of legends. To have their lives squandered so pitilessly by such naïve and shortsighted men is the poison in the pill. Many of us were aware that Saddam Hussein sent a team of assassins into Kuwait who failed to assassinate the first President Bush. We never knew it would have such lingering consequence on “the avenger” in the Bush clan, his oldest son.